Grand Knights History, the somewhat ambitious PSP RPG with online play in mind, has been picked up by XSEED and is slated for release in the US. Released not too long ago in Japan (and to good sales no less), this is one of two games being made by Vanillaware (the other one being Dragon’s Crown for PSV/PS3). Grand Knights History is a turn based RPG where you choose one of three kingdoms to represent (Avalon, Logres, or Union) and create a squad of knights to take into battle. You can also go online with your squad of four and battle other players (representing one of the other kingdom). For European gamers out there, Rising Star Games will be handling the publishing duties. 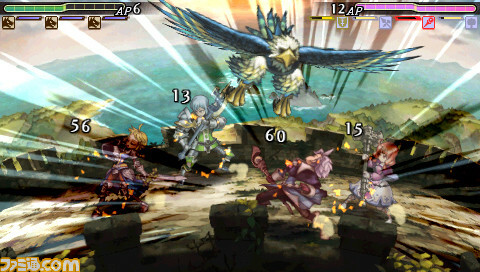 Grand Knights History is slated for release sometime around Winter on PSP. This entry was posted in Gaming News and tagged avalon, gkh, Grand Knights History, logres, my body is ready, union, Vanillaware on September 22, 2011 by Steven T..